Make DuoFlex your perfect ergonomical assistant. With DuoFlex you can clean indoor windows, tables, desks, mirrors and stainless steel surfaces. 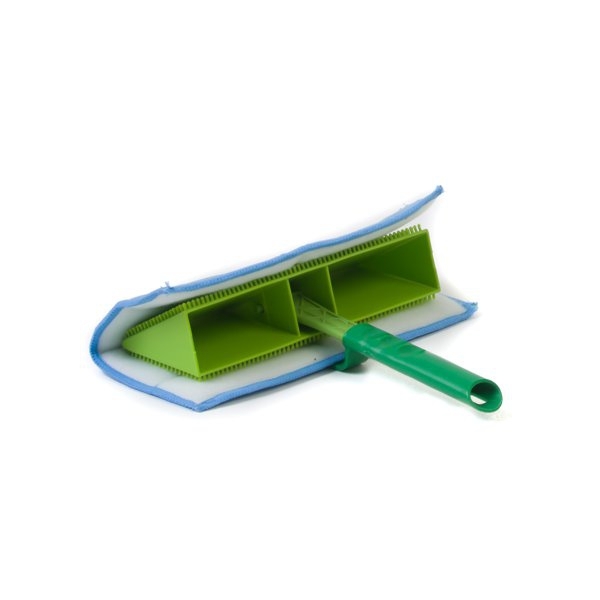 With just one squirt per 1 square meter on the pad or directly onto the surface and DuoFlex with Ultra-Microfiber finishes the job. When the pad is dirty on one side simply flip the DuoFlex tool over. When both sides are dirty the pad can be washed at 60 degrees. The Ultra-Microfiber cloth makes manual cleaning of surfaces easier due to the cleaning friction against the surface and without additional pressure through the tool. All smooth and sealed hard top surfaces for best cleaning results. Suitable for use in healthcare, nurseries, schools, universities, offices, public buildings, food industry, hospitality, residential, shopping malls and pharmaceutical areas etc. Used In conjunction with Rekola Reflex UMF and Abrasive Soft, pads for DuoFlex. The Rekola Reflex DuoFlex tool is useful for cleaning glass, mirrors, stainless steel and any hard surface which needs to de dusted or cleaned. 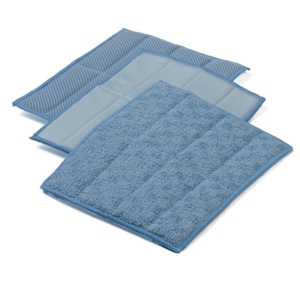 In case of water removable dirt, add water to the pad or directly onto the surface to be cleaned and wipe with the DuoFlex until the dirt is removed. Apply the pad of choice to the Velcro hooks on the tool. Ready for use! The unique combination of Ultra-Microfiber and the pressure to the surface created by the shape of the tool, allow cleaning without putting any force to tool during cleaning. We recommend cleaning the tool after use and before being stored. Rekola Reflex DuoFlex is made purely of synthetic materials. It can be used in recycling programs; alternatively because of their high energy value and zero emissions other than water and CO2 they can be safely disposed of by use of controlled energy-supply programs. Suitable for walls, mirrors, windows, glass panels, white boards, monitors, tables, desks etc. DuoFlex can be mounted with different type of pads; glass cloth pad 11-90076, AbrasiveSoft pad 11-90077 and mesh cloth pad 11-90080. The DuoFlex pads are designed for the Rekola Reflex DuoFlex tool. The DuoFlex pad is available in 3 different types – AbrasiveSoft for more tough cleaning, Glass for glass/mirror, and Mesh for general cleaning – glass, mirrors, tables, desks, monitors, flat surfaces – DuoFlex pads will do the job. With just one squirt per square meter onto the pad or directly on to the surface the DuoFlex with Ultra-Microfiber will finish the job. When one side of the pad is dirty, flip it over and you have a clean side. When both sides are dirty simply remove the pad and wash at 60 degrees.